Pipe Jacking is a wide family of no-dig installation methods for the installation of underground pipes without digging up the surface. 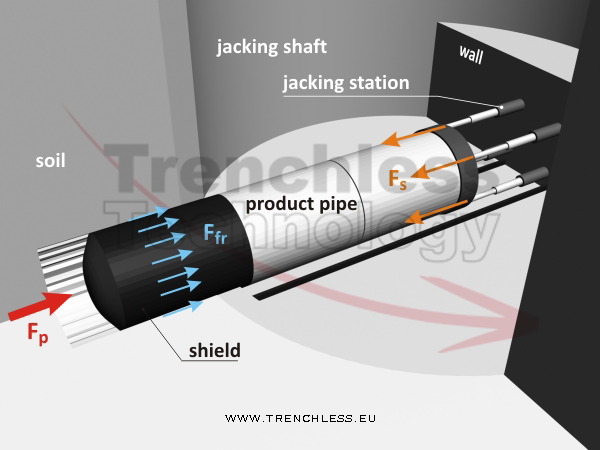 The pipe is installed by thrusting it into the ground behind a front shield, as the tunnel is excavated. Depending on shield type, on excavation technique and on the method used for removing and transporting the debris, several different pipe jacking technologies have been developed since the invention of this method. AUGER BORING, MICROTUNNELING and SMALL BORE TUNNELLING (SBT) are the given names that identify just some of the many methods for installing underground pipes by pipe jacking.